Robert Cattle was working with John Prince up until Prince retired. This was on 1st November 1807. Robert Cattle took James Barber into partnership with him on 1st January 1808, so was only working alone for 2 months. He arrived in York in 1792 and was made a partner of the firm of Hampston and Prince. His work continued through to 1814 when his partnership with James Barber was dissolved. He died in 1842. This pair of sugar tongs is a little special as they show the Lion Passant facing right. This is only known to have happened at York during the period between 1793 and 1808 and was not used all the time. 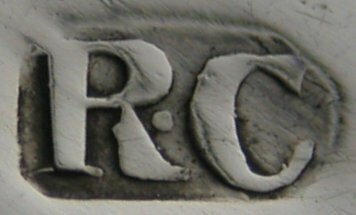 Robert Cattle had a mark registered with James Barber in 1807/08. These tongs are therefore dated between 1st November 1807 and 31st December 1807. He sent in a parcel of work on 4th December 1807 which included 6 pairs of sugar tongs. These must be one of those 6.